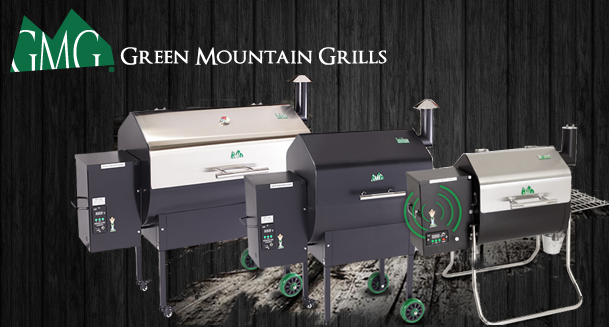 We are excited to offer the Green Mountain Grills. These are a superior wood pellet grill with some unique features. The grills have digital readouts for setting temperature and an on-board computer. A sensor inside the cooking cavity reads the temperature ten times every second and sends this information to the on-board computer. The controller uses this data to adjust air and pellet flow to maintain the temperature you set. As an option, they can be operated by wi-fi! You can set the temperature in 5 degree increments and it will stay within a few degrees of what you set. The Green Mountain Grills cook anywhere from 150-500 degrees which means you can cook anything from slow smoking jerky to searing a perfect steak – all with the flavor of a wood smoker. Super easy to use.. Learn more about the models..